Our major assets are the proximity of the sites of the landing of June 6, 1944, the calm of the place, the space, the comfort associated with a refined style, and a cordial reception. 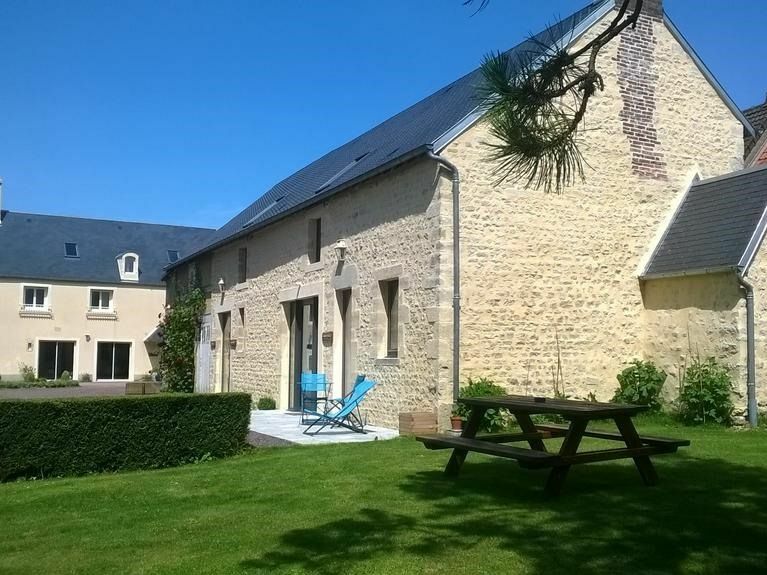 The property is an old farmhouse built in 1798, on a park of 5000 m². The Pomme Rouge cottage was built in 2015, in a part of the outbuilding. 50m² for 2 people, 1 bedroom with queesize bed, kitchen, bathroom with shower, toilets. Linen, towels, electricity, free wifi, included. We left paris in 2013 in order to renovate this old farm. My wife Rosemaine was born in Martinique (french west Indies island), and loves cooking normand and creole specialties. Myself, Loïc, was born in Bayeux. I like new projects, working in the garden, receiving guests from all over the world staying and visiting our beautyfull normand countryside. We have 3 children, Sébastien, Noémie, Baptiste, and a lovely dog called Chaussette.